CoverTec concrete floor coating systems combine the ease of installation with the required toughness and durability for challenging industrial and chemical environments. In addition with this toughness and durability CoverTec concrete floor coating systems can be installed in a variety of existing colors. CoverTec coatings, offer some of the best stain protection in the market and are highly chemical resistant. A highly effective and proven system for cleaning and sealing oil contaminated concrete. CoverGrip is a cost effective and less decorative version of CoverQuartz with a more industrial look. It uses non-colored quartz crystals as its aggregate and pigmented coatings as its topcoat saving on material cost. CoverFlake is a cost effective, highly durable, decorative flooring system using CoverFlake vinyl chips as its decorative aggregate. CoverQuartz is an ultra durable decorative flooring system with extreme impact, wear resistance, and nonslip characteristics using CoverQuartz colored quartz crystals as its decorative aggregate. 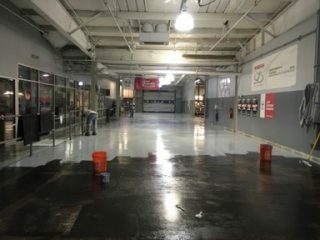 An industrial self-leveling resinous flooring system that creates a high gloss, smooth, seamless and ultra-durable surface. Tough high build epoxy color coat used for a variety of surfaces including concrete, metal and wood. Very low odor high solids epoxy. Highly effective Protection to concrete against oil, brake fluid, and petroleum based solution. Developed for warehouse and work shop concrete. Highly Wear resistant hold ups to fork lift traffic. Stops oil bleed back from oil contaminated concrete, prevents stop the deboning of coatings and floor toppings. Low odor epoxy coating for concrete wood and vinyl surfaces. Easy to apply. Fast drying, with a variety of colors. 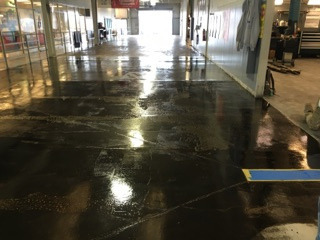 Fast drying flexible epoxy for parking decks and industrial flooring.